As more and more information is coming out about the health benefits of Vitamin K2, it is important to not get confused about the K vitamins. Most people are familiar with Vitamin K1, which is found in leafy greens and helps with blood coagulation support. People taking prescription blood thinners are often told to stay away from diets rich in leafy greens (vitamin k1) and also do not take a vitamin k supplement because it can possibly thin your blood too much. But what about Vitamin K2? 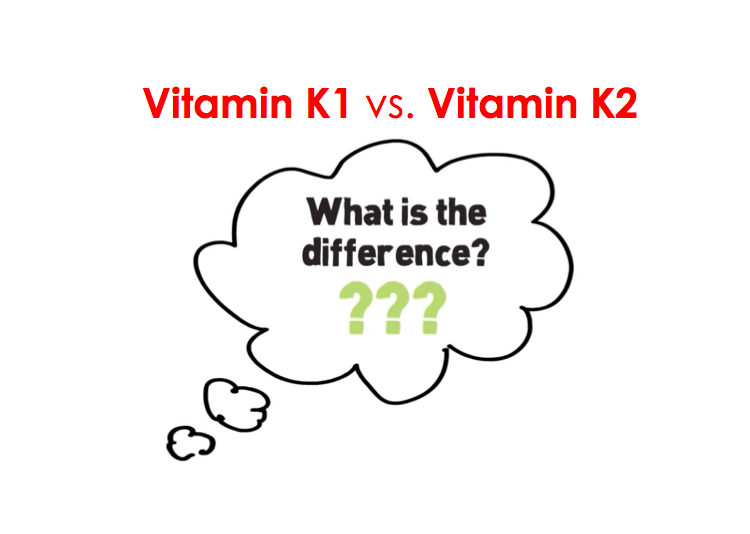 Vitamin K2 is very different from Vitamin K1. Vitamin K2 in an adequate dose is very difficult to get from your diet, however, fermented soybeans or “natto” is one of the richest sources of this vitamin. An easier and more convenient way of getting Vitamin K2 is through supplementation. Much different than the role of Vitamin K1, Vitamin K2 is responsible for channeling calcium into your bones and teeth while keeping it out of the arteries. Think of Vitamin K2 as the traffic cop for calcium. To clarify one more important fact without complicating things too much is to explain the two different types of Vitamin K2, MK-4 and MK-7. Vitamin K2, MK-4 is the synthetic form of K2, it is often cheaper in price, however, it has a shorter half-life meaning it stays in the system for only a few hours. Usually, someone taking Vitamin K2, MK-4 will have to take one capsule up to three times a day to ensure it stays in the system. The other form of K2 is MK-7 which is considered the optimal form of Vitamin K2. MK-7 is the natural form of K2, which is going to be a little more expensive since it is naturally sourced from nature (fermented soybeans), however, it has a longer half life meaning it stays in your system for up to 2-3 days and has better absorption. Supplementing with a natural, MK-7 form of Vitamin K2 allows you to get an adequate dose in just one single capsule per day. So when looking for a Vitamin K2 supplement, do your research and make sure you select a Non-GMO, allergen-free, natural Vitamin K2, MK-7 supplement. Recommended dose is 300mcg (1 capsule) per day, or as directed by your healthcare practitioner. Innerzyme Vitamin K2, MK-7, 300mcg offers the highest potency, natural K2 on the market in a convenient one a day vegetarian capsule. Research shows daily supplementation with Vitamin K2 in the natural form of MK-7 supports cardiovascular, bone and soft tissue health.